In case you missed our workshops last semester, you will have another opportunity to attend and get the skills you need. 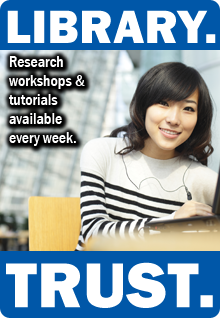 Two topics are being offered – Academic Honesty and Discovering Articles, Books, and more. In the Academic Honesty session, you will become familiar with GSU’s Academic Policy, know what plagiarism is and how to avoid it, as well as learn about methods and tools to cite your sources. In the Discovering Articles, Books, and more session, you will learn how to successfully navigate the library’s tools and resources to complete your research assignments. All workshops will be in Classroom 2 from 12pm – 1pm. Select link to register. This entry was posted in For Students, Services and tagged Academic Honesty, First Year Instruction, Library.Trust., research workshops. Bookmark the permalink.